The Indio Police Department released this body cam video after two of its officers responded to a gas leak at a duplex that triggered an explosion, killing the homeowner and injuring one of the officers. 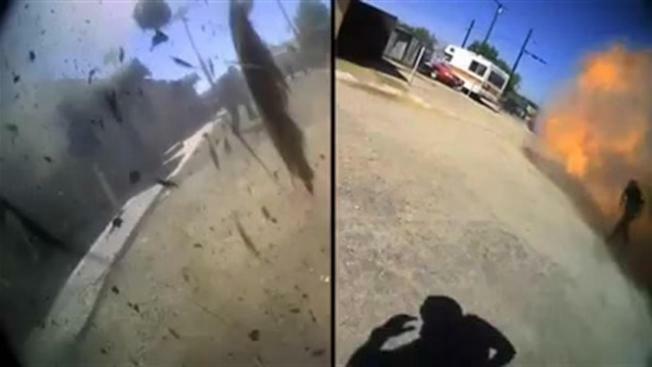 A Southern California police department has released body cam footage after two officers responded to a gas leak at a duplex that triggered a deadly explosion. The explosion, which is caught on both cops' body cams, killed the homeowner at duplex in Indio, about two hours east of Los Angeles, and injured one of the officers. Officer Nathan Quintana and trainee officer Israel Campoa responded to a call of a gas smell coming from the duplex on August 8. The footage, released this week, captures the second a fireball shoots from the home, followed by debris raining down on both officers. The homeowner, 61-year-old David Lee Ellis was airlifted to a hospital, where he died the following morning. KMIR reports that Quintana, despite suffering second-degree burns to his right arm, continued helping nearby residents evacuate. He has now returned to duty.